We live in a diverse world filled with unprecedented opportunity. There is a call to move past the barriers that stand between us and those who may be different. Eric Michael Bryant has seen tolerance shown to those who are different than us â€” racially, religiously, sexually, politically, economically â€” and believes there must be more. After all, Jesus didnâ€™t just tolerate people; he embraced them all with love. 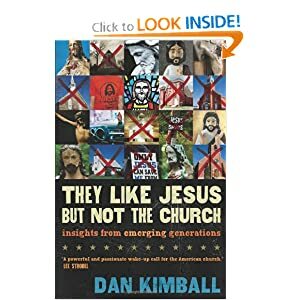 Not Like Me: A Field Guide for Influencing a Diverse World helps people of faith effectively love, serve, and reach people overlooked by the church. Using lighthearted humor, engaging personal stories, and a â€œparty theology,â€ Bryant shows us how to love our neighbors and fulfill the vision Jesus had for the church from the beginning. Whether that is through building relationships with the help of bounce houses, stand up comedy, or piÃ±atas, followers of Christ will be inspired to actively engage the world around them. Dave Gibbonsâ€™ â€œMonkey and the Fishâ€ is both thought-provoking and inspiring. In it Gibbons presents a new metaphor for ministry. He focuses on the concept of third-culture. Third-culture is a phenomenon that is noticed in the children of missionaries and military families that live in different countries. To survive and thrive in the new culture these children learn to adapt to different cultures by assimilating into the new culture without rejecting their original culture. Such children tend to adapt and thrive easily in differing contexts because of this third-culture ability. Gibbons argues that the church should reflect this third-culture and be able to adapt and thrive in any context. One of the great historical weaknesses in the churchâ€™s mission has been the meshing of Christianity and culture. There is a tendency for missionaries to expect new believers to conform to their culture. George Hunter III describes this of the Roman Churchâ€™s method of evangelism ca. 400 AD in â€œThe Celtic Way of Evangelism.â€ The Roman missionaries expected the Germanic and Celtic people to become Roman before they could become Christ-followers because they believed that their culture was inferior and unable to mesh with Jesusâ€™ teachings. This is the same problem many evangelical churches have today. They confuse their culture with the content. They confuse how they communicate the gospel with the gospel. A third culture church sees value in other cultures and seeks to become a part of the new culture to communicate the life-giving, life-changing message of Jesus in that context. There is one concept in Gibbonsâ€™ book that Iâ€™m struggling with; his emphasis is on multi-culturalism and investing in the under-resourced. This has much to do with his background personally and in ministry. Third-culture is not just a way to get more diversity in a primarily white suburban church. Third-culture is a new metaphor to describe what in the past was known as incarnational ministry. The goal is to present Jesus and his love to people where they are at, whether itâ€™s the single mother in a subsidized apartment, a corporate executive living in a large house in the suburbs, a Midwestern farmer, or a tea grower in East Asia. All are loved by God and we need to reach them with the message of Jesus where they are at, not bring them into our western culture then share Jesus with them. With that said, â€œMonkey and the Fishâ€ will encourage you to reach out to the people around you in new and fresh ways and give you practical steps to help you focus yourself and your ministry on the gospel and how to communicate it no matter the culture into which God is calling you.